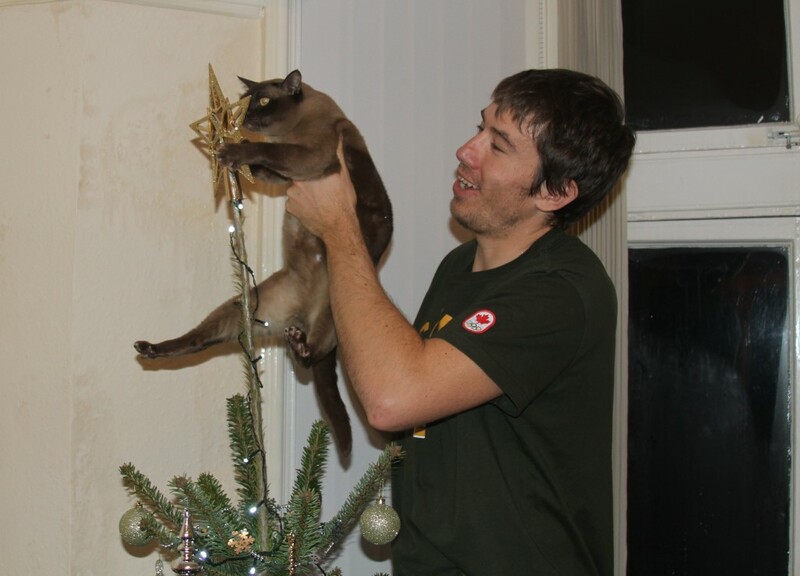 Basil adds the final touch to our tree! Yesterday was the second Christmas I’ve spent as “Mrs. Howard”, and the first time that Malcolm and I hosted Christmas. It just happened to be in Oxford, England – and we were hosting other rowers from the crew (who didn’t go back to North America) as well as some of their friends and family. This could be perhaps one of the reasons why the note didn’t get sent out… but it is also the reason that Christmas felt so special this year. First of all because Malcolm and I were together, and secondly because our little flat became a home as we welcomed other friends who were far from their homes. This year, the role of Santa Claus (for me) was played by the UK Border Agency! They gave me an early gift of seeing some of my family and friends as I returned briefly to acquire my Visa. Then just as I was fearing it would take longer than expected and I would be in Canada for the Holidays, my visa was issued and passport returned! I headed back to my UK home, just in time to prepare our little flat for the Holidays and for Malcolm’s return from their training camp. Christmas to me this year (and all [adult] years to be honest) is never about the presents, and always about the presence. It is easy to take for granted the people you spend so much time with – your family, close friends, co-workers. While we love these people so much, we can easily get on one another’s nerves, or take our frustrations out one another… but geography has given me perspective. I have so many wonderful people who care so deeply for me. They support me immensely, each in their own way. They enrich my life with their love-stories-talent-perspectives-generosity-kindness (I could go on and on). They love me for all of the beautiful-horrible-interesting-boring-lovely-awful things about me… and each time life takes me away from them I realize more and more how very precious each one of those relationships are. I am so grateful to each of you. Another Christmas lesson I learned this year is to appreciate the little things. For example, I was in the kitchen baking and watching a Christmas movie when I heard the sound of music. I paused the movie, but the sound faded out. I continued on until I heard it again. This time I peaked out our front window and saw a group of carolers! I threw my jacket and shoes on and rushed out just to hear the tail end of a song. A kind man and his daughter informed me that I had happened across our street’s annual carol sing, and then welcomed me to join in… and so as if in a fairy tale I walked along a sweet English road, surrounded by kind strangers and candle light, singing music celebrating this special time of year. Caroling combines the joy of music, fellowship, and the spirit of the season! With all its shams, drudgery, and broken dreams, it is still a beautiful world. Be cheerful. Strive to be happy. May you and those you love find peace and happiness this Holiday. And may the coming year bring you new opportunity, courage, strength, faith, joy, and bliss! Much love, from our little family to yours!! This entry was posted in Feel Good, Holidays and tagged Christmas, Family, Friends, Inspiration, Kindness, Life, quotes, Spirit by erika. Bookmark the permalink.